Well known Billionaire Entrepreneur and Chairman of Heirs Holdings, Tony Elumelu has written an inspiring letter to the next generation. Young African, You are brave, you are resilient. You are savvy, you are entrepreneurial, and unlike the generations that have come before you, you are much hungrier for success. You call your ambition, “your hustle”, and you have several of them because you are tireless and eager to achieve financial independence – no matter how elusive it appears. You are optimistic but you are also anxious. You have seen others toil long and hard for economic security in vain, decades of labour without fruit. Some of your friends may have discussed emigrating with you – legally or illegally, and some may have lost their young lives crossing the Mediterranean in search of a future overseas where their talents are recognized and rewarded. You may even know a few in Libya, unsuspecting victims to the ugly acts of slave trade. A combination of these factors has left you disillusioned and disconnected. You don’t believe in politics. There is no use in getting involved. You have seldom experienced good governance, so you think, “What’s the point?” But despite the gloom, there actually is indeed a point. My generation and the ones before may have failed you, and the infrastructure for success glaringly absent – a persistent darkness in place of electricity, a stifling business environment that discourages enterprise and innovation, debilitating bureaucracy, inaccessible public officials who remain oblivious to your needs, an outdated education system in urgent need of reform– and the list goes on, but, if there’s anyone with the power to transform our continent and reshape our economic and social trajectory, it is YOU. There is formidable power in your intellect and creativity, your talent and ingenuity are rare, and your resolve and determination against all odds, can drive great change. But most importantly, the greatest force is in your numbers. Together, all 600 million of you that are under 30 years old, have the potential to be the most influential bloc on this continent. The indescribable influence that you can collectively wield, I hope that you soon fully understand and hopefully, deploy. Today, I’d like to discuss the inescapable reality of politics with you. 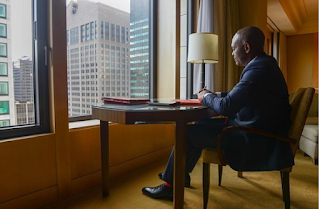 It has been a busy week of traveling from Lagos to Boston, to Los Angeles, and in a few hours to New York, to receive BCIU’s inaugural Dwight Eisenhower Entrepreneurship Award, but I thought to take time out this evening to share a few thoughts with you. I have been inspired to share this with you after listening to my former professor at Harvard, Prof Michael Porter, whose session during our leadership council meeting of the Harvard Kennedy School Center of Public Leadership, was insightful, powerful, and very thought provoking. His well-articulated argument emphasized that as a people we cannot afford to remain passive about politics. Though his reference region was America, there are strong parallels with our own situation in Africa. The main root cause of our continent’s underlying failure to pull the majority of its citizens from the unyielding clutches of poverty is poor leadership, so then why do we continue to tell ourselves that politics exists in a realm outside our own realities? Why do we refuse to engage in the political process of identifying and supporting visionary candidates, instead we remain at the mercy of political leadership committed to putting private interest ahead of public interest. Leaders who are beholden to the ideology that political parties come before citizens. Leaders who are private gain-seeking actors. What we desperately need is a continent-wide awakening. We must grow to become active citizens who are committed to getting involved. The system is not self-correcting, there are no market forces at play to ensure that it corrects itself. It will require human actors – me and you – to identify and dismantle the structural impediments that fuel the status quo of bad leadership. We must address this issue both systemically and systematically. Our democracy has become very disconnected from being democratic, we must bring power back to the people. We must reform the rules of our electoral processes to inject more transparency. We must transform politics from being an industry for a few interests, to being about the people and addressing the public needs. We must change the oligopoly nature of our politics today to being one for the majority. The barriers to entry are high in politics, and very often, our best brains and talent are discouraged from running for office. We must dismantle these systems that keep away talented, individuals from joining the race. We must open the door for generations knocking after us. We must take advantage of our demographic dividend, millions of young people who are ready to make a change. We must welcome this new generation of new ideas and we must democratize access to opportunity for all. We must get more women involved in the process because when you empower women you empower communities. Structural reforms mean that no one individual can make this change alone, but with our collective voices and the realization that this is our time and that no one but us can save our continent, we can achieve change. We can no longer outsource politics or governance to people we do not trust. We must understand the inextricable link between governance, economic growth and national security. To pretend that politics does not influence the entirety of our lives harms us more than it benefits us. We must change the rules of the game. We must put up a coordinated front to reorient our values and bring power back to the people. Our leaders must be the best amongst us – those with the most transformative ideas and the capacity to deliver. . It should be the best amongst us leading us in government, in the military, in our judiciary and of course the corporate sector. We must instill accountability in our processes, but also hold ourselves accountable. We must play our own role in identifying and empowering those amongst us best placed to make this difference. To abscond from this duty is to be negligent of our responsibility to our continent. It won’t be easy, but nothing good comes easy. A famous man once said you should learn to categorize all your problems in three sections: Easy, Impossible and HARD but doable. When it’s easy, you should give it to someone else to handle. When it’s impossible, you shouldn’t bother with it. But when it’s hard but doable, you should go straight to work to make it happen. My fellow Africans, I appeal to you that though this task seems hard, it is entirely doable and we must begin this journey. Let us rise to this challenge and begin to elect leaders who we trust in and are confident will help us realize the social and economic hopes of our continent.